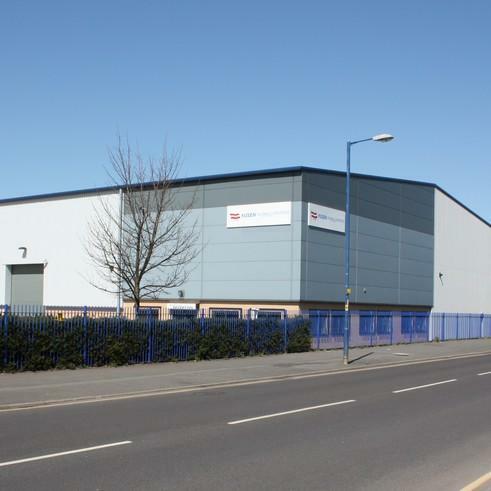 Following the demolition of an existing building, this project could be said to be a ‘model’ industrial unit of circa 35,000 sq ft. The building, a mixture of ‘built up’ profiled and micro-rib composite cladding, was constructed to a clear height to underside of the steel portal frame haunch at 8 metres, on a 6 metre grid with a single span of just over 37 metres. The scheme ‘benefited’ from being ‘placed’ on an ideal site in both shape and proportion, resulting in a site cover that was up at 48%, whilst maintaining adequate car parking and a yard in excess of 25 metres to the whole of the frontage.